They're homeless, but a group of men and women from Texas has made it to Carnegie Hall. The storied New York City concert hall is the venue Wednesday evening for a performance by the Dallas Street Choir, all singers recruited from urban streets and homeless shelters that has been performing since 2015. About 20 members of the choir were to be joined by 17 residents of a Manhattan homeless shelter. The singers include Michael Brown, who lives under a bridge in Dallas when it rains and on a hilltop in sunny weather. "We may be homeless, but we're not voiceless," he said at a rehearsal Tuesday, "so let's use our effort to remind people that we still have hope and it will never die." Dallas Street Choir conductor Jonathan Palant has also brought in some world-class luminaries for the performance: mezzo-soprano Frederica von Stade, soprano Harolyn Blackwell, composer Jake Heggie and composer Stephen Schwartz, who wrote the Broadway hits "Godspell," ''Pippin" and "Wicked." Palant said he got the idea for the choir a few years ago while volunteering with a homeless services organization. It started out as a Christmas event — a big meal at a homeless shelter with entertainment by a group of singers that rehearsed with Palant for just a few hours. But that inspired Palant to start a weekly musical session open to anyone who wanted to sing. Members of the choir come and go frequently. They don't always produce perfect sounds, and there are moments of slight cacophony, "but our members sing with heart like no other choir I've ever worked with," said Palant. Never in its 126-year history has a musical ensemble of homeless performers appeared at Carnegie, said the hall's archivist, Gino Francesconi. Brown got his first shower and haircut in weeks for the tour. Normally, he survives going to soup kitchens, and aims to get a job as a waiter. He's an energetic, bright-eyed choir member, while some others are physically frail; one woman relies on a walker, another uses a cane. The evening at Carnegie Hall, starting at 8 p.m., is titled "Imagine a World — Music for Humanity." Von Stade will premiere Heggie's new setting of Hub Miller's "Spinning Song," with Heggie at the piano. With the choir, Schwartz will perform "For Good" from "Wicked," along with Blackwell and von Stade. Rounding out the evening will be the homeless choir offering Broadway songs, capped by personal stories. Tickets are $25 for any Carnegie seat, with proceeds going to organizations that support the homeless. The New York City Department of Homeless Services has donated some tickets so members of the homeless community can attend. The choir is also performing Thursday at Washington National Cathedral in Washington D.C.
About $200,000 needed for the New York and Washington trips came from previous concerts in Texas, plus a private grant. 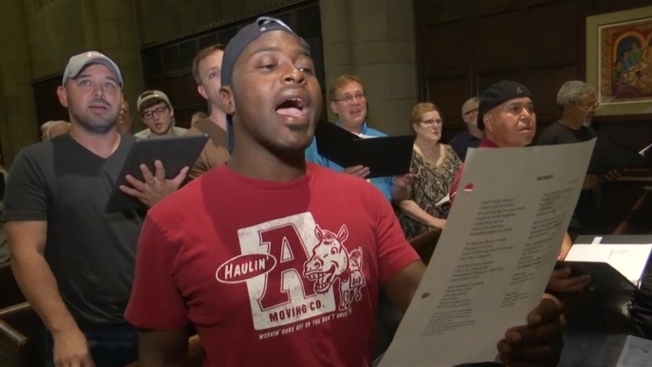 Carnegie's Weill Music Institute pulled in the homeless singers from Manhattan. The New Yorkers are members of a community choir and will sing two numbers on the program. At least while they're in New York, the singers have a roof over their heads — a hotel on Manhattan's Upper West Side near the Valley Lodge shelter where the local performers live. "This is serious, man — Carnegie Hall in New York City," says Brown. "We have to show people that we didn't come from Texas for no reason."